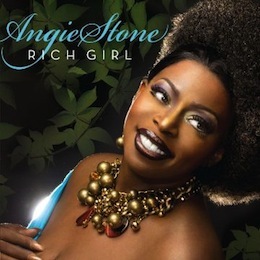 A singer, a self-taught keyboardist, and a prolific songwriter, Angie Stone’s first claim to fame was being the lead vocalist on Vertical Hold’s smooth urban dance track “Seems You’re Much Too Busy.” An R&B Top 40 hit during the summer of 1993, it eventually led to a solo career, and her debut album Black Diamond was issued in 1999 by Arista. In six years, Stone had definitely gained an old-school, autobiographical vibe, exemplified by her hit ballad “No More Rain (In This Cloud),” which has samples from Gladys Knight and the Pips’ “Neither One of Us (Wants to Be the First to Say Goodbye).” Contributors included Lenny Kravitz and former Tribe Called Quest member Ali Shaheed Muhammad as producers, and Stone’s ex-boyfriend D’Angelo as a vocal guest on “Everyday.” Stone, a native of Columbia, SC, began singing gospel music at a young age at First Nazareth Baptist Church. Her father, a member of a local gospel quartet, would take his only child to see performances by gospel artists such as the Singing Angels and the Gospel Keynotes. She moved to J-Records in 2001 for her second record, Mahogany Soul, and the record cracked the Top 40 thanks to the pop/R&B hit “Brotha.” Three years later, her third record Stone Love became her biggest hit, with a number 14 placing. In 2004, Stone Love was issued, followed by a live recording of her greatest hits in 2005.